For Mario Schönwälder and Frank Rothe, their journey of invention continues on Filter-Kaffee 100 (45'25"). Two previous releases set the stage for even more elevated works and this CD does indeed realize such potential. 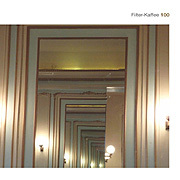 Presenting six substantial tracks worth of concise, well-conceived and executed Spacemusic, Filter-Kaffee 100 conveys a range of expression - indicating this pair's restraint, vigor or willful abandon. At times driven by the logic of their instruments, Schönwälder + Rothe produce layers of intriguing sequencer runs, which echo above overlapping harmonic planes of Mellotron chords and synthesized strings. Equating the cycling ordered notes of these sonic actions with the measurement of time, we also find diverging, expanding sections of a subtler pulse. Supported by gently drifting spacey atmospheres and breathing tones, these zones develop slowly, and engulf us as much in midnight black as in stellar light. From potent electronic sound, to a beautiful nowhere, it is here that Schönwälder + Rothe tune into the quieter frequencies. Some abstract music is intended to be experienced in relation to the listener in space. With Schönwälder + Rothe, they are thinking about outer-space, inner-space, or any space but the room in which you are seated. 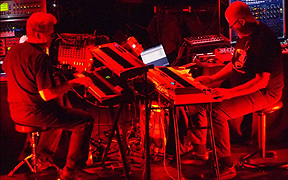 Working in a genre known for experimenting with the sensory effects of sound, this duo emits a spark of life throughout the depths of an icy universe.